It has come to our attention that your planet is due for apocalypse. The Galactic Empire understands it can be difficult to process this kind of news but DON'T PANIC. We have prepared the following helpful instructional FLOWCHART to help you work through your wide variety of options in a thorough, yet timely fashion. Click to enlarge. Brought to you by the Death Star Cares initiative. Send this to Harold Camping. *Snort* thanks for making light of supposedly life altering event that I really hope doesn't take place today. Made me laugh. LOVE IT! But wondered why there was no box for "I'm a woman of science." I mean, I'd like to be treated fairly and all before I get blown up. Thank you. I needed this. Now, I feel prepared. Impressed by the new product range, never knew Deathstar offered 'zombie apocalypse', please send me a brochure. interesting! despite the fact that We have no specialist, however would like have to know more and more, on your weblog just intriquing, notable and beneficial details. Keep it up! 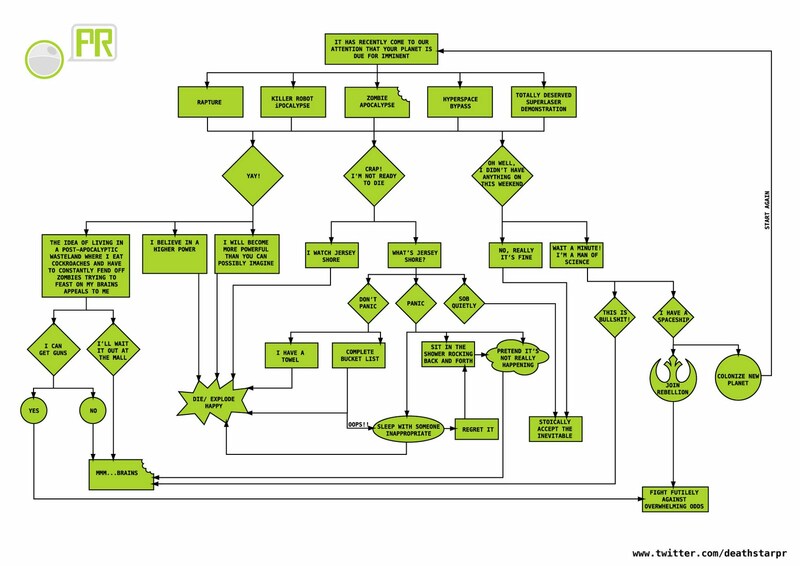 What is the diagram software you used to create this flowchart diagram? was it ms visio, ms word, or Creately ? Buyrunescape4golds.com is one of the biggest RS Gold online provider, you can always find cheap RS 2007 Gold, RS 3 Gold and Runescape Accounts here. You can feel free and safe to buy our products here. Clone Wars In Review: 1x02 "Rising Malevolence"
Clone Wars In Review: 1x01 "Ambush"